Prize money for players who lose in the first three rounds at this year's Wimbledon Championships has risen by over 100% over a three-year period. The overall prize fund has increased by 10.8% to £25m, with first round losers seeing their reward rise from £11,500 in 2011 to £27,000 in 2014. All England Lawn Tennis Club chief executive Richard Lewis said: "I'm not saying they are pleading poverty. "But they aren't making huge sums of money for world-class sportsmen." "Top 100 players, who benefit from direct entry into all four Grand Slams, can now earn nearly £100,000 a year just for losing in the first round. "Wimbledon are not rewarding failure, however, but instead helping some of the lower ranked players meet large coaching, travelling and living expenses. "One unwanted consequence could be more one sided first round matches, as players may be less likely to withdraw through injury with such a large sum of money at stake." 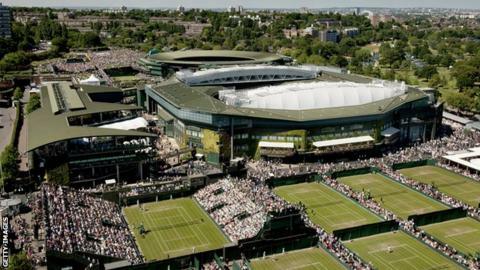 AELTC chairman Philip Brook told BBC Sport: "We have been conscious of the fact that we have many players coming to Wimbledon who are making their way on the professional circuit looking to reach the top echelons of the sport. "It is a very long and a very expensive road on which to travel, and we've felt for the last two or three years that we need to do more to help these players on that journey." The singles champions will receive £1.76m, 10% more than Andy Murray and Marion Bartoli received last year. Brook added that defending champion Murray's slip to eighth in the rankings will not harm his seeding for this year's tournament. Wimbledon use a surface-based system to determine seedings, based on their performance on grass in combination with their ranking. As a result, Brook said the system will have a "significant impact" on Murray, who triumphed at the Queen's Club and Wimbledon last summer, as well as reaching the Wimbledon final in 2012. "There will also be quite a significant impact on Roger Federer and Novak Djokovic; there will be some adjustment," added Brook.